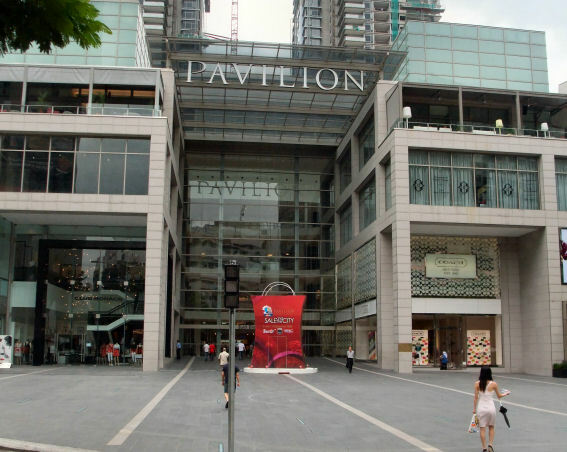 The latest shopping centre in the Golden Triangle of Kuala Lumpur is the "Pavilion". It has the world�s most exciting retail brands>. 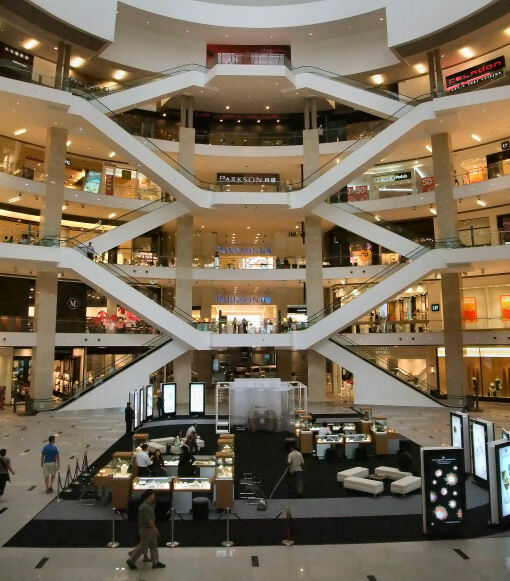 The Pavilion is close to the Westin Hotel, the Regent Hotel and other shopping centres like Sungei Wang, Bukit Bintang and LOT10. 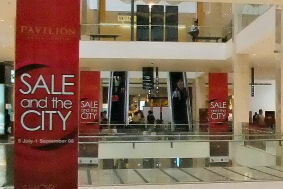 The Pavilion is a 7-storey shopping centre and opened its doors on 20 September 2007. It has also two blocks of luxury residential towers, a 19-storey office tower and a proposed 6-star boutique hotel. The shopping centre is easy to reach, when you sleep in one of the hotels in the Golden Triangle.If you don't you can reach the Pavilion by monorail and bus. The station of the monorail is "Bukit Bintang". Cross the street at the LOT10 shopping complex. Down the road you'll see the Pavilion. By bus you can take the Rapid KL and get off the bus at Bukit Bintang, The bus numbers are: B102, B103, B110, B113. There's also car park. Entry and exit points are along the Jalan Bukit Bintang and the Jalan Raja Chulan. The shopping complex is very quiet. There are a lot of famous shops, like Guess, Esprit, Zara, Armani, DKNY, Giordano and many others. Compare the prices of the products in your own country and you'll find the prices in the Pavilion low. My Guess watch, which I bought in Europa, was about �80,- more cheaper here. There's also a concierge team for assistance, if you can't find the shop you're looking for. There are counters on Level 2 and 3. The Pavilion entirely air-conditioned, so after shopping you can have a delicious frappucino at Starbucks or a cup of coffee at the Coffee Bean. You can change money at Money Changer or withdraw some cash at one of the ATM's of the Maybank (ATM = Automatic Teller Machine) on third level. There is one big department store: Parkson. In Parkson are 4 levels and here you'll find all the famous marks. 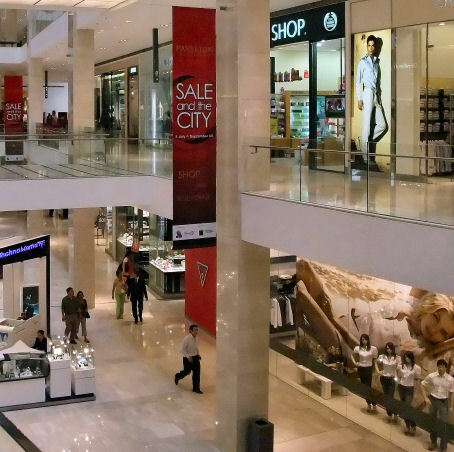 In the shopping centre you find further vogue shops of: DKNY, Levi's, Giordano, Tommy Hilfiger, Guess, Versace, Bossini, Calvin small, Armani and Esprit. Luxuriously accessories are for sale in the shops of Burberry, Chopard, Rolex, Hermes, Gucci, Prada and Chloe. On fifth and sixth level are several cinemas. On the third, fourth and fifth floor there fitness and health clubs. Hungry? You want to lunch or dine? There are several restaurants. There are Thai, indian, Turkish, Mexican, Greek and Japanese restaurants. But there is also a Pizza Hut, KFC or Carl's Jr. The opening hours are from 10.00 am to 10.00 pm (7 days a week). The station of the monorail is "Bukit Bintang". Cross the street at the LOT10 shopping complex. Down the road you'll see the Pavilion. You can take the Rapid KL and get off the bus at Bukit Bintang, The bus numbers are: B102, B103, B110, B113.